ShouldISkipClass.com has a new look! This isn't breaking news, I actually completed these updates at the end of last semester, but I thought it was still worth posting an update. 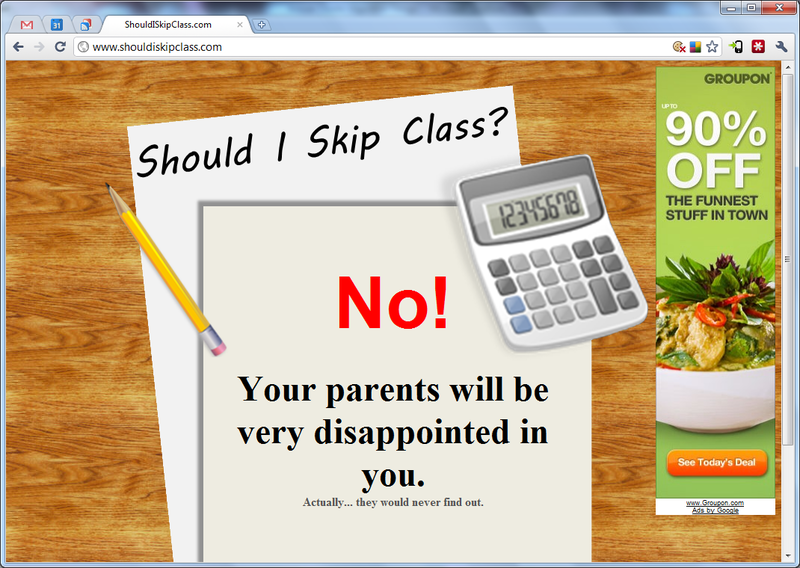 ShouldISkipClass.com is a very simple website that I made on a whim that displays random reasons why you should or shouldn't skip class. There is an option on the page for users to submit new reasons of their own. If I think they are good enough I will add them to the rotation. This website was getting quite a few hits when I first launched it last semester, but the interest dropped off during the winter break. Now that school is back in session, if you like this site, share it with your friend! I'm a huge fan of Tablet PCs, but I've not been very excited about slates. 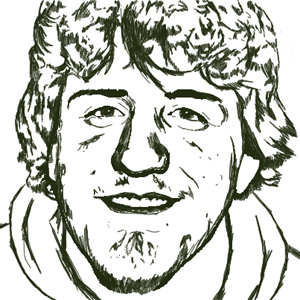 The iPad in particular is a device that I am not a huge fan of, but I do recognize its usefulness. Lets start with a little history lesson. A little more about the Xoom, but mostly PR and not much about how it actually works. Still a fairly awesome video. This product definitely looks exciting. What I'm really excited about is Android 3.0 and this gives you a better idea of what all the fuss is about. With my college career coming to an end, making the move from a pen enabled Tablet PC to a touch based Android slate may be a logical next step. While I'm excited about Android development for the phone, the real potential is in developing applications specifically designed for slates. While Microsoft has had technology available for years, at the moment I find the Android approach more attractive. The one gadget that I want above all others and it is very simple, but extremely powerful. All of these monitors and screens and gadgets in our life could be replaced with the single gadget that would rule them all, a wearable HUD. Personally, I'm not interested in the hardware as long as it works, but once it is out there it will be impossible to prevent me from developing software for a functional HUD. There have been some baby steps towards creating a HUD, but it looks like some major progress was announced at CES 2011. The Raptyr glasses by Vuzix won the CES Innovation Award. The details seem to be sparse, but they are see through and seem to be exactly what I am looking for, or at least an early model. Hopefully more details including price become available later this year. I would be partial to an Android based interface since I already have an Android phone and experience developing on that platform. The important part of the augmented reality component would be overlaying information on real world objects. While truly accurately versions of a HUD overlay is still years away, I'm excited to see the progress that some companies are making. Raptyr is the world’s first sunglass style Video Eyewear that is designed specifically for the wide variety of Augmented Reality applications that are in development for consumer, commercial, medical, educational, gaming and defense markets. It provides a natural and easy to use interface to applications and it is a very powerful platform that offers a personalized and mobile home-theatre experience that enables digital content to be mixed into a real worldview. Today Raptyr is compatible only with devices with VGA and USB interfaces. Future enhancements to the product will include HDMI compatibility and connectivity for mobile devices such as the iPhone and Android phones. Initial markets for Raptyr will be commercial and research applications. As enhancements are made to Raptyr and as sales volumes increase, the company expects consumer applications to become available. The real inspiration for a HUD comes from the books Daemon and Freedom. Hopefully we are only a few years away from a fully wearable computer system. It seems strange to say it, but my college career is almost over. One last semester before I get my masters degree and it is going to be a crazy one. I have a long list of things that need to be accomplished before May 2011 and graduation gets here. I'm only taking two classes, so my course load shouldn't be that bad, but that isn't what is going to keep me busy. This semester I will be finishing my thesis which will be keeping me very, very busy. The goal is to improve my DPX Answers application to perform some type of automated clustering to assist with the grading process. I am also going to be teaching Java this semester which I am hoping will be lots of fun. This is something that I definitely wanted to do it shouldn't add too much stress to my workload. One of the biggest sources of stress this semester will likely be the planning and execution of E-Expo 2011. My plan is to stay on top of everything and get things done early, but things don't always go according to plan. Hopefully SGA don't take up too much of my time, luckily I enjoy serving on the Senate a little more than I should.